With just a few hours left in the January transfer window, it is extremely unlikely Real Madrid will be planning something for the deadline day, but Florentino Perez is already busy planning his summer moves to bolster the squad. According to Spanish Media outlet, Sport , which quoted a journalist Eduardo Inda- a collaborator on the show 'El Chinguito' - Los Blancos are looking to offload superstars like Marcelo and Isco in the summer. Things are not going according to the plan for Isco and Marcelo under new boss Santiago Solari. Isco rarely started since Santiago Solari took over and it is crystal clear Isco is way down the pecking order in the current squad. On the other hand, Marcelo's poor form saw him losing his place to Sergio Reguilon. 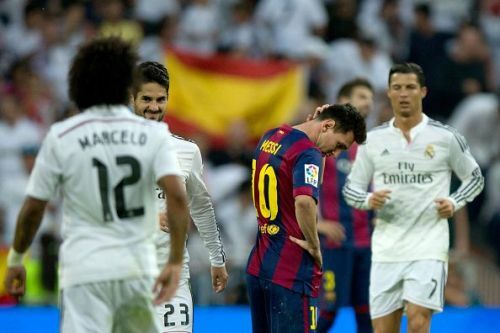 Real Madrid is enduring a terrible season considering their sky high standards. They are currently 3rd in the La Liga table, 10 points below league leaders Barcelona. Moreover, their goal difference (8) is the second worst among the top five teams in the league. Despite Karim Benzema's recent good run of form, Los Blancos are without a talisman in the current season. Moreover, the arrival of Mariano Diaz has not proven successful yet and there is a distinct lack of depth in the current Real Madrid frontline which is quite concerning. Los Blancos are in the hunt for a new star man, as they want to build a team around the player. Florentino Perez is desperate to build a squad with new faces and revamp the frontline due to Los Blancos' poor performances in this season. According to the report, Real Madrid will be a complete overhaul of their team with a list of players who will be offloaded to pave way for new starlets. The list includes the likes of Lucas Vasquez and Keylor Navas but the most prominent names remain Isco and Marcelo. Real Madrid are considering spending huge to build a fresh team. They usually get the player they want but it remains to be seen who Florentino Perez will let go to make way for new stars. After the departure of Cristiano Ronaldo to Juventus, Real Madrid are showing inconsistency but will be keen to end their season with at least one major silverware. Santiago Solari's men will face Girona in the Copa del Rey, and Ajax in the Champions League, and will hope to continue their recent good run of form in LaLiga.